50% OFF! 4 in 1 Multi-functional Universal USB Charger Cable worth Rs.600 for just Rs.300! If maximum connectivity is what you're after, this cable delivers like no other. Although this is just a charging cable, it's nevertheless able to charge 30-pin and Lighting port iOS devices, as well as regular micro USB Android devices and ones with micro USB 3.0 connectors (like the Samsung Galaxy S5 and Galaxy Note 3). 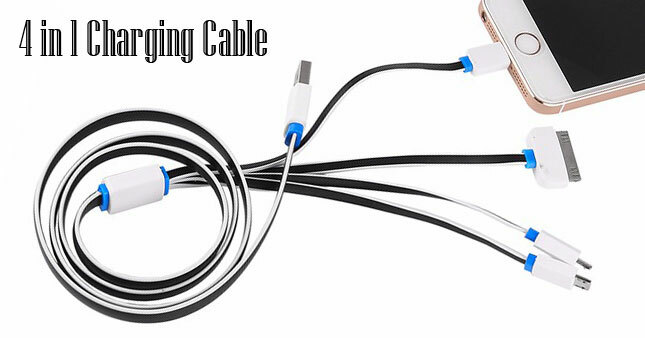 The cable is 3 feet long and features a simple, portable design that makes it rather convenient. 4 in 1 charging cable universal 8-Pin/30-Pin/micro USB cable/Note3 port. USB version: 2.0. Lightweight, portable to carry, convenient to use. Compatible with iPhone, iPad, Samsung, Sony, Moto, HTC, Nokia, etc. If you use this cable charging for 2 or more devices, please use an 2A adapter. Note: this charging cable can not be used to data sync. Voucher is valid only for one 4 in 1 Multifunctional Universal USB Charger Cable.